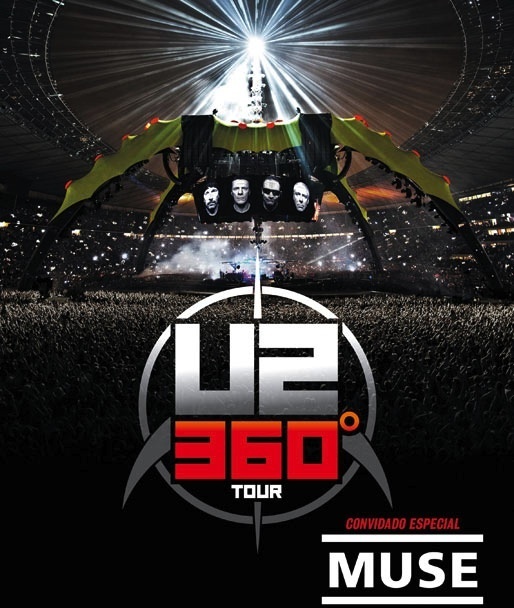 Next up for U2360° Chile, Argentina and Brazil as the band return to South America for the first time in five years. It was the Vertigo Tour in 2006 when the band were last in South America and in Buenos Aires that the groundbreaking live set U23D was shot. Last time the band were in Chile, then President-elect, Michelle Bachelet, the country's first woman leader, was backstage at the Estadio Nacional to present Amnesty International's 'Ambassadors of Conscience' award to the band and Paul McGuinness. In Brazil Edge, Larry and Bono showed up for Carnival in Salvador and City of Blinding Lights was in the set list. It's always special to visit South America. Are you coming to the shows? Tell us what you're looking forward to. I'm so excited about seen U2 again in Argentina! Only three days to the first show!! Please, include Breathe and Ultraviolet in the set. Thanks for put the best music and the best emotions to my life!!! after waiting for many years i m going to see you!! i hope you can play ulytraviolet, how is gonnna ride your wild horses, out of control!! i know tjhis show will be the best moments of my life!! finally, after years of waiting, since the first time you came , i 'm going to go to a wonderful show, to see my first favourite group ever, thanks for coming again to Argentina, i hope you can say a few words to madres de plaza de mayo. and i hope you play sing ultraviolet, out of control, and who is gonna ride yuor wild horses!!! i know this will be a show that i wont forget!!! Begining with Breathe...and songs with No Line, don´t have stay out. Classic Unforguettable fire and Ultra Violet either. Thank's so much. See you there!!! Bono, please! don´t forget NESTOR KIRCHNER, remember him like a good Man and the best President of Argentina. So as, remember his wife, the actual President Mrs Cristina Kirchner and The mothers and Grandmothers of "Plaza de Mayo". THANK YOU TO VISIT ARGENTINA, AGAIN. To me U2 is the ROCK of Peace, Love and Memory. I feel that U2 music flows through my veins and my body. I see you in the Estadio Unico Ciudad de la Plata!!!! H2, guys, I just want to say I LOVE YOU. Your music has been with me through all my life, you are part of my life. Please, do play The Unforgettable Fire for me! I can`t wait to see you again. The best for you. I have been following you since I was nine, now I am 40 years old, I can't believe that I will see you in April 2nd in Estadio Unico de La Plata for first time!! I am so so anxious! GOD THANK OF YOU!! The show in São Paulo will be awesome. It's a dream to have U2 in South America, especially Brazil (my country). I'm sure that U2 will chose the best Setlist to play here!! One of the best songs from the latest album must be on Santiago Gig. Also, we want Breathe, Unforgettable Fire, and Mercy. Just more nineteen days to go to a U2 concert again. They haven't played The Unforgettable Fire since August 15, 2010 in Horsens, Denmark. I'm really looking forward to listening to it in São Paulo on April 10, 2011. The Unforgettable Fire is one of the most beautiful songs I've ever heard and reminds me of good times. See you soon U2! Twelve days left until the second night in Argentina and I cannot wait any longer. I'd really love to hear Acrobat or a very special song on April 2nd. I've been listening U2 for more than five years. I couldn't go to the Vertigo Tour in 2006... Now I'm very happy; I think it's going to be incredible and unforgettable! Thank you all for all this years of the best music. Please plaY BREATHE in Brazil april 10th!!!! Going to a U2 concert it´s the only dream of my life that I still haven´t accomplished!! !But after april 10th,the dream will become true!! Please, play Ultraviolet, Crumbs, Who´s gonna ride your wild horses, Electrical storm...Please, play for 4, 5, 6 hours, because nothing will be enough for me...I CAN´T WAIT!!!!! April 9th I'll be there !!! It will be my first U2 show, please play "No line on the horizont" , this song is special. This is my third U2 concert!!! I'm going to the Red Zone, could we please have Ultraviolet??? That would be even more perfect than it already surely is!!! WE'R LOOKING FORWARD TO 'PROVIDE' U2 THE BEST AUDIENCE THEY HAVE EVER HAD! I'll go on april 10th and 13th in Brazil, it'll be my first concert and centanly it'll be unforgettable! PLEASE, PLAY GONE! This song in fantastic! I'm getting nervous. Lots to be prepared. I have to find the perfect outfit, the baby sitter for my kid, the queuing strategy, the transportation to La Plata, the time-table, vocal exercises to join Bono in the singing, meditation to connect with the band to the best setlist, Butterflies in my stomach are appearing. What a big party it will be !!!! We are waiting for you guys !!!! ... is that my unborn child can see the best rock band in the world in Santiago, Chile. That is able to sense that time stands still and in the end it's just four friends doing what they like ....... Open heart surgery ....... I love you son, I love you U2! !